How did Latin Americans represent their own countries as modern? By treating modernity as a ubiquitous category in which ideas of progress and decadence are far from being mutually exclusive, this book explores how different groups of intellectuals, between the late nineteenth and the early twentieth century, drew from European sociological and medical theories to produce a series of cultural representations based on notions of degeneration. 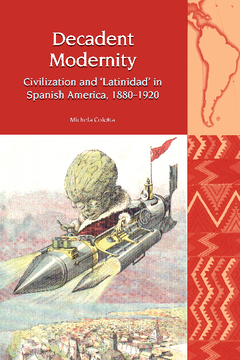 Through a comparative analysis of three country case studies − Argentina, Uruguay and Chile − the book investigates four themes that were central to definitions of Latin American modernity at the turn of the century: race and the nation, the search for the autochthonous, education, and aesthetic values. Using a transnational approach, it shows how civilizational constructs were adopted and adapted in a post-colonial context where cultural modernism foreshadowed economic modernization. In doing this, this work sheds new light on the complex discursive negotiations through which the idea of ‘Latin America’ became gradually established in the region. Michela Coletta is Teaching Fellow in Hispanic Studies at the University of Warwick and Associate Fellow of the Institute of Latin American Studies, University of London.